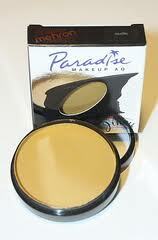 Paradise Makeup AQ is a colour saturated, water-soluble, semi soft, moist cake makeup. used with water and applied directly to the skin over a base of traditional powder, cake or liquid makeup using a brush or sponge. Our unique blend of ingrediants includes Aloe and Camomile to help make paradise makeup AQ safe and gentle to the skin. Glycerine, avocado and coconut oil provide rich vibrant colour, saturated coverage. The colour will dry quickly with minimal rub off. Washes off easily. No special removers needed. Brushes and sponges will also clean easily and last longer. Diamond FX is a waterbased product that is highly pigmentated . Best washed off with soap and water. 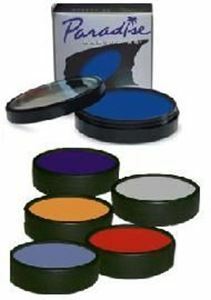 Kryolan Aquacolor Waterbased Make-Up Metallic Colours gold, silver, copper, bronze, silverblue, silvergreen, silverlilac. Very good metallic colours. Please note there are two golds. Always best washed off with soap and water.